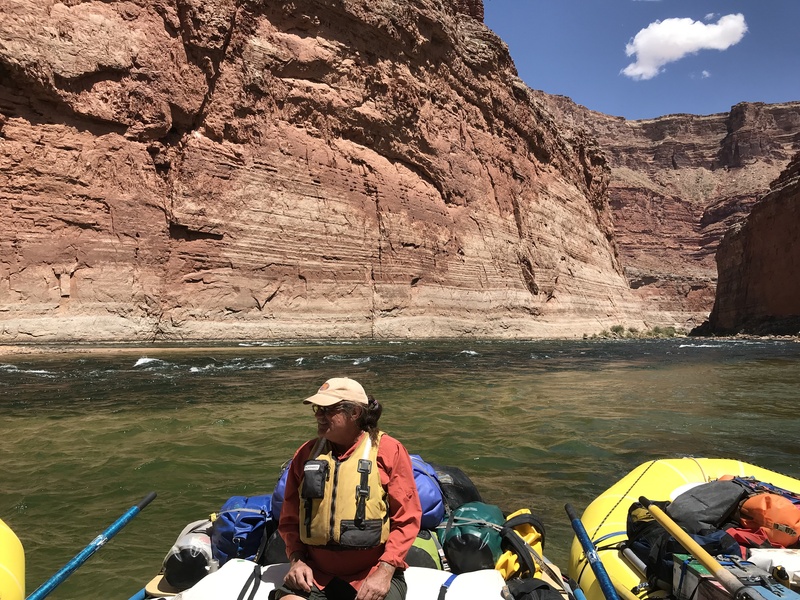 It has been our good fortune to row 280 miles of the Colorado River through the Grand Canyon twice in the last seven months. This is rare for private boaters limited to one trip per calendar year and subject to a lottery system where a decade can pass between successful applications. Carved very recently, by many accounts within the last six million years, the river has exposed a section of the earth’s crust that provides a rare opportunity to study the ways our planet worked in the past. The clear message of this section through the crust is change. Constant and unremitting change; change working simultaneously on different time scales. Change working differently in different parts of the Canyon. A boat trip down the Grand Canyon begins a few miles below Glen Canyon Dam and Lake Powell, at a place called Lee’s Ferry. Faulting has resulted in the canyon being eroded back here, allowing access by road. The next road access is 226 miles downstream. The red formation in the middle background is the Moenkopi formation, deposited above sea level in a low energy delta and braided stream setting. Moenkopi is of earliest Mesozoic age, the age of dinosaurs, but dinosaurs had not yet evolved. Tracks of Therapsids, the reptilian branch that would eventually lead to mammals can be found in the Moenkopi mud. Below Lee’s Ferry, you bid farewell to the Mesozoic, and enter a realm where older Paleozoic rocks form the canyon rim. Conformity in geology is when sediments are deposited in an uninterrupted sequence. The most fundamental changes in the Grand Canyon are the unconformities, where a time interval is missing. The first such unconformity is between the Mesozoic Moenkopi and the underlying Paleozoic Kaibab limestone. 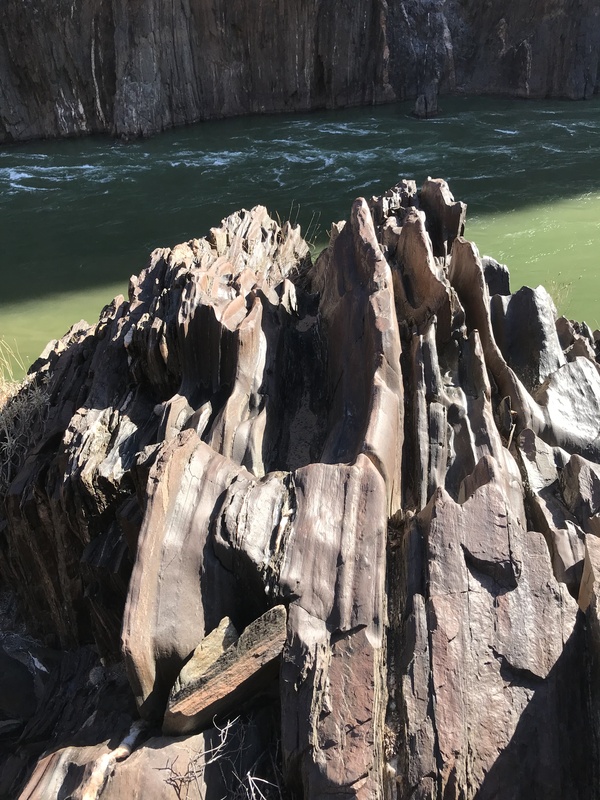 It is difficult to know if sediments were simply not laid down during the interval of unconformity, or if they were laid down and later eroded away. The missing time between the Moenkopi and the Kaibab means that the Grand Canyon section does not speak to the greatest extinction in the history of life. This extinction marks the end of the Paleozoic and the beginning of the Mesozoic eras. Fortunately for us, our Moenkopi Therapsid relatives survived this extinction. Unconformities, missing time intervals, mark most layers, and all layer groups in the Grand Canyon. 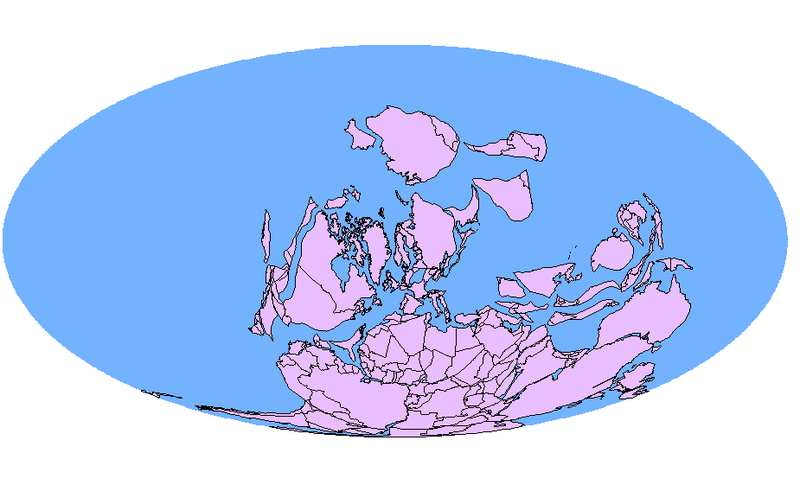 Above is the configuration of continents 250 million years ago at the Mesozoic/Paleozoic boundary according to Christopher Scotese’s Paleomap Project. 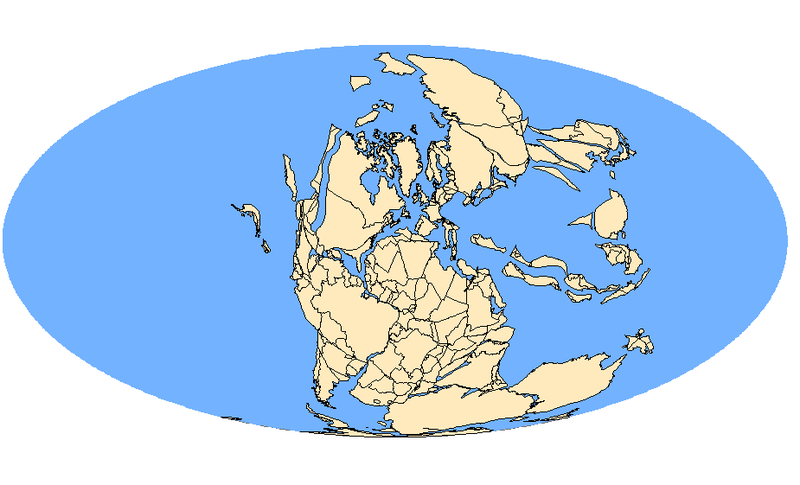 The supercontinent Pangea was beginning to break up, and a seaway had formed between North America and Africa. Above is the configuration 260mya during the formation of the Kaibab Limestone that forms the rim of the Grand Canyon. 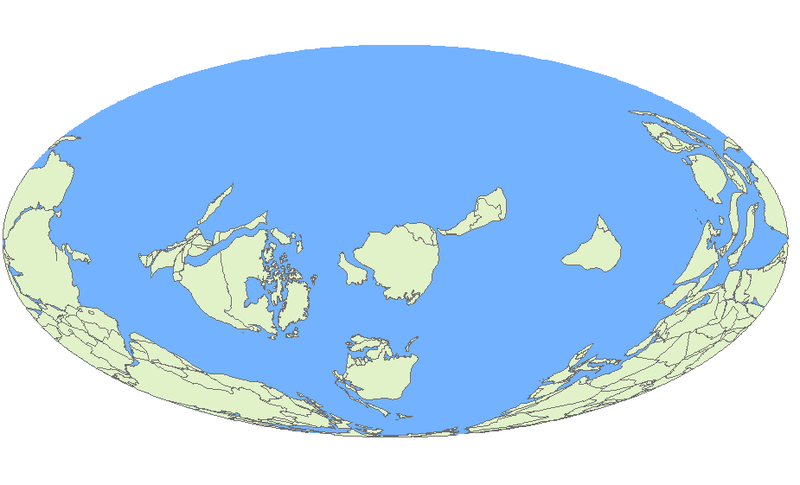 The 250mya continents remain in tan beneath and it can be seen that Pangea tightened up and rotated as we progress backward in time. The Kiabab was very much an inland sea, and as the river cuts quickly through the upwarp visible in the first photo, the Toroweap formation beneath the Kaibab formed in an arid inland lake like the current Great Salt Lake. By mile 4 the river has already cut to the underlying Coconino sandstone, laid down as vast dunes like the current Sahara Desert covered large areas of western North America. You may have guessed that the Coconino and Kaibab are separated by an unconformity. By mile 8 the river has cut through to the Coconino to the Hermit shale, separated by an unconformity. The Hermit was laid down in low angle braided streams on land. 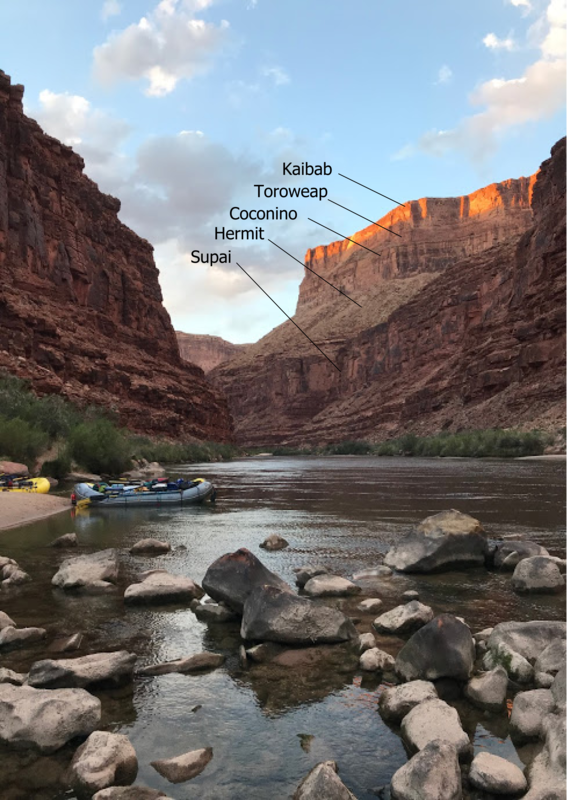 By mile 12, separated by another unconformity, the Supai group is exposed. The Supai group is characterized by alternating marine limestone cliff forming units and stream deposits laid down on land that are less resistant to erosion and form slopes. 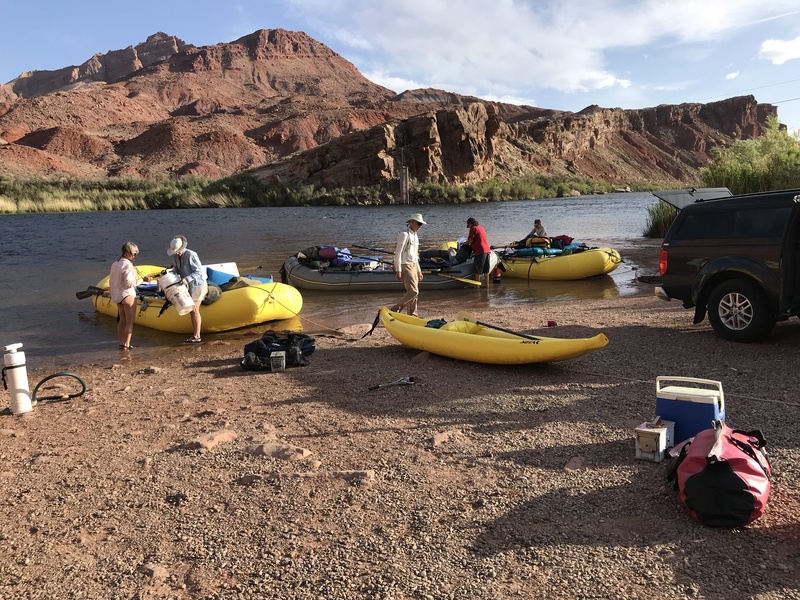 A typical river trip makes its first camp in the Supai. It has been a busy day cutting through 50 million years! 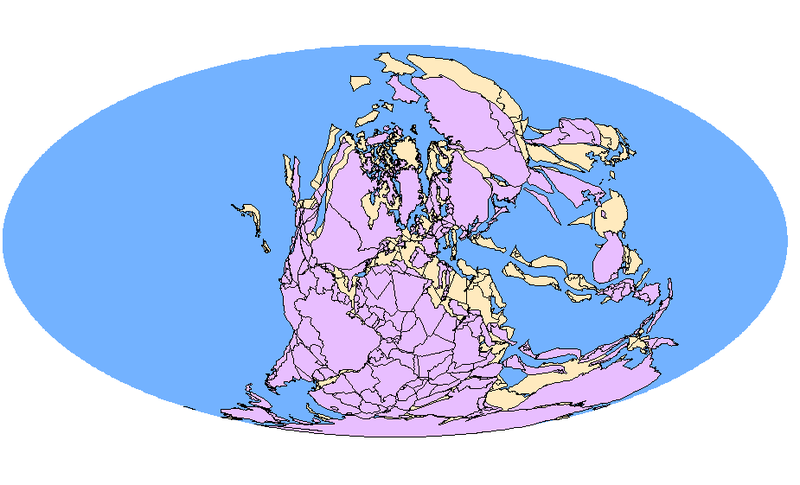 At 300mya the continents are shown in purple with 250mya as tan background. Remember that the tan areas were ocean 300mya. Entropy is a fundamental force of nature that acts to minimize all gradients. It is universal, working from molecular scale to the forces that move continents. Rocks fall from the canyon walls to the river because the gradient of altitude is reduced. The river flows to the Sea of Cortez because the gradient of altitude is reduced. “Ah”, you say, “this is just gravity.” The river shows us it is not just gravity. When the water is forced to separate around an obstruction, usually a rock, the water curls back upstream, defying gravity, to fill the void and reduce the gradient in its own cohesion. We call these “holes” and try to avoid the big ones as they can turn your boat upside down when the water curls back upstream. The Supai has an unconformity within it that separates the Permian, the youngest period of the Paleozoic era, from the older Pennsylvanian. Besides the “icehouse” period we currently live in, the Pennsylvanian/Permian transition about 300mya marks the center of the mist recent “icehouse”, a long period of glaciation that extended well into the Permian. The Pennsylvanian is notable for the highest atmospheric Oxygen levels in our planet’s history. 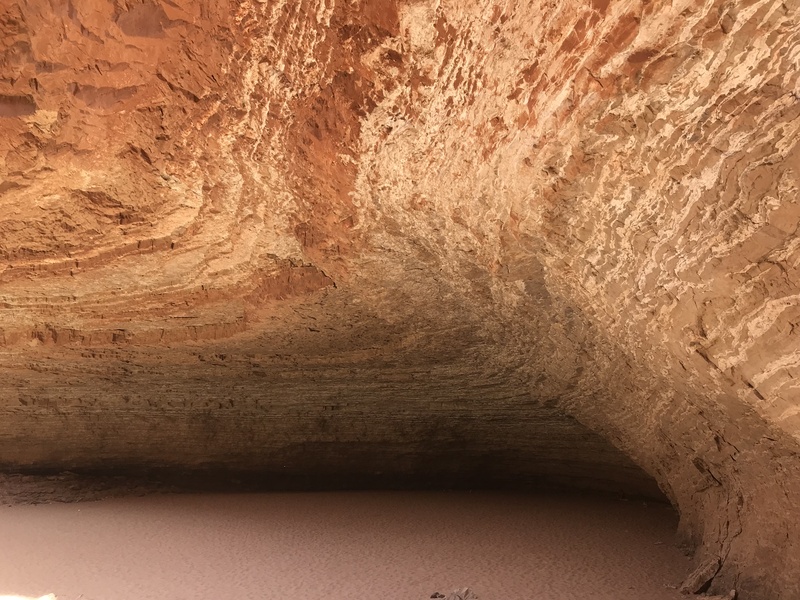 It takes the river 11 miles to chew through the Supai, and at mile 23 the Redwall limestone that defines the older Mississippian period in the canyon is first exposed at river level. Of course, an unconformity separates it from the overlying Supai. The Mississippian period saw the first amphibians crawl on to land to live, but in the Grand Canyon the Redwall Sea resulted in the deposition of carbonate shells of foraminifera, corals, et al 800 feet deep. The resulting limestone is resistant to erosion and forms imposing cliffs above the river. We can see above that even the massive Redwall has striations. Despite its name, the Redwall limestone is not naturally red. It is painted red by color from above. The lighter bands have higher carbonate concentration, are more resistant to erosion, and stick out from the wall further than the softer intervening bands. The softer bands are more porous and hold the paint better. Above is detail of Redwall Layering from the near the bottom of the Redwall section at the famous Redwall Cavern. The layers get tighter toward the bottom of the Redwall sequence, and some folding aided the river in undercutting this cavern. 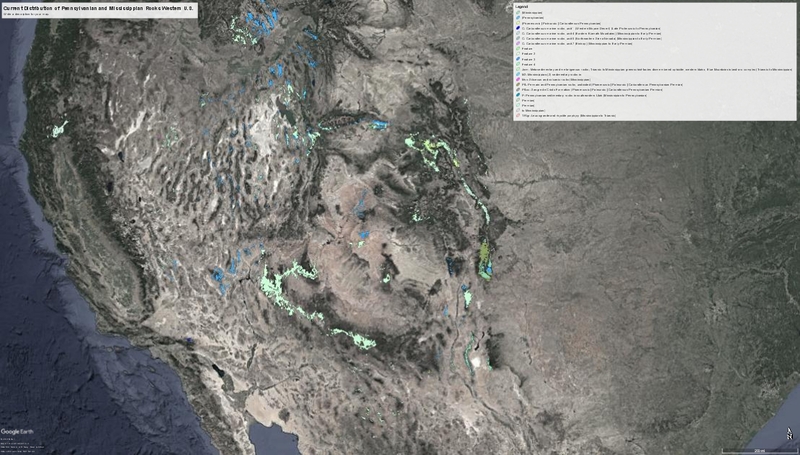 Above is the current distribution of Pennsylvanian (lower Supai) and Mississippian (Redwall) surface rocks in the western United States. These are broad categories chosen by individual State Geologists, and some Permian rocks are included, but it can be seen that shallow ocean covered large areas. These are all sedimentary rocks except some minor volcanics in central Nevada. These volcanics and the folding at the bottom of the Redwall are probably related to the Antler overthrust in Nevada where sediments were pushed over what was then a continental shelf. Above are the continents 360mya, the transition between the Mississippian Redwall and the older Devonian Temple Butte Formation. 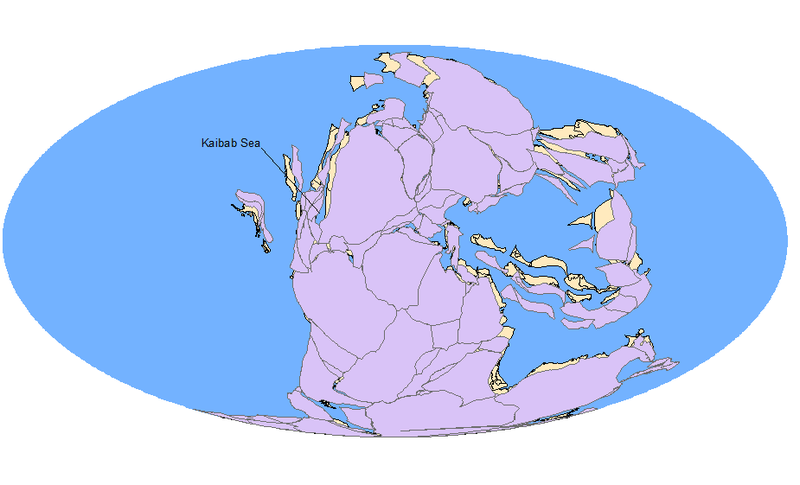 Dominant ocean floor spreading was sweeping the continents into a pile we call Pangea. The Temple Butte is really not encountered at river level by boaters because it thins out against higher terrain at the time in the eastern Grand Canyon. There are a few lenses of Temple Butte between miles 38 and 48. The Temple Butte thickens to the west and becomes a significant layer in the western Grand Canyon, but above river level. For boaters, the Redwall sits atop the Cambrian Muav Limestone, first seen at mile 36. The unconformity between these two spans three periods, the Ordovician, Silurian, and Devonian. The missing 120 million years between the Redwall and the Muav is an awfully long time, considering that complex multi-cellular life forms have only been around for 600 million years. Even the 100 million years between the Muav and Temple Butte, where it occurs further west, is a very long time. The magnitude of this unconformity can be appreciated by comparing the continents at 360mya above and 500mya below. 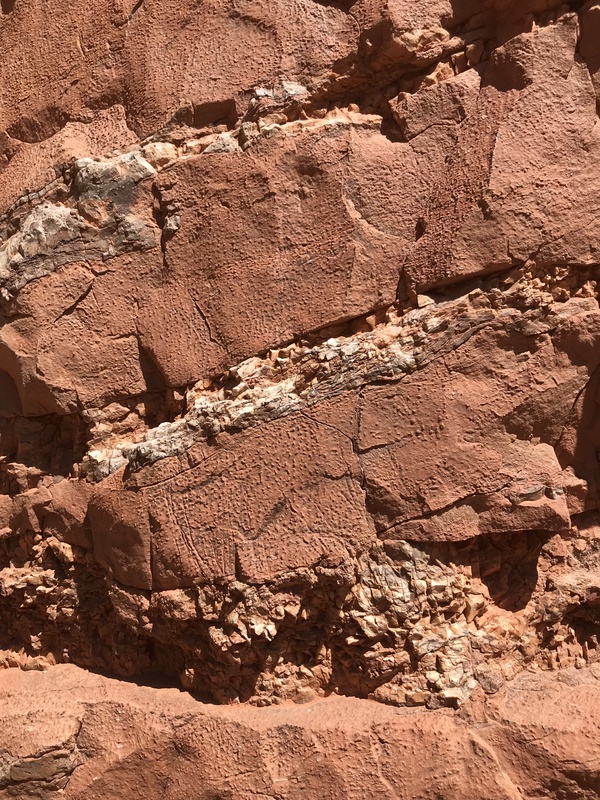 It is not really clear why The Grand Canyon region would have remained elevated and not received sediments; or why these sediments could have been laid down and later eroded away. From the Mid-Cambrian above to the Mississippian Redwall at 260mya, North America moved from west to east, and not very much compared to the other continents. Just for fun and to recap the quarter billion years from the Kaibab to the Muav we have traversed in ~50 river miles, the continents are shown above at 250mya in tan and 500mya in violet. 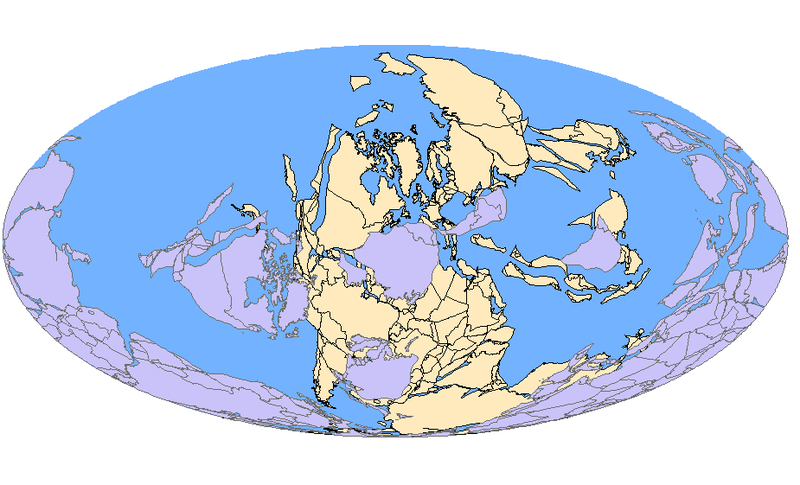 It can be seen that North America moved comparatively little as Pangea formed, and the other continents basically self assembled around North America, the oldest continental craton. 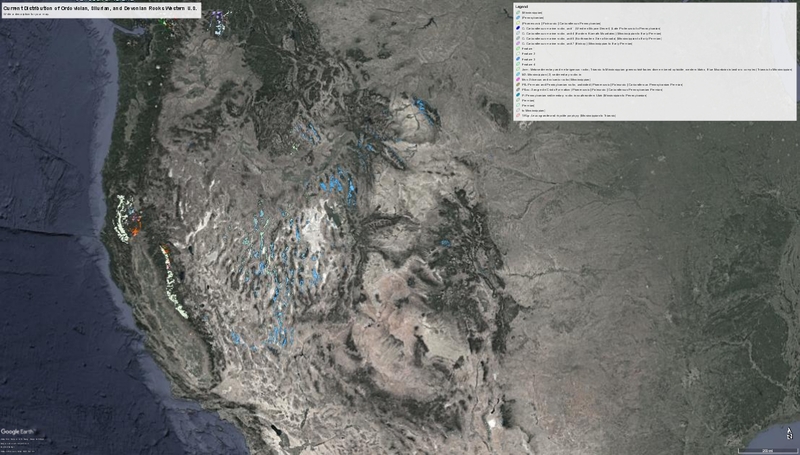 Above we show the current surface rocks deposited during the time between the Muav and Redwall in the western US. There seems to have been a broad seaway to the west in Idaho, Utah, Nevada, and California. Not just the Grand Canyon, but the entire Colorado Plateau seems to have missed out on deposition during this time. Perhaps it was elevated like it is today. The Muav is the youngest member of the Tonto group, a group of three periods taken to represent a classic marine transgression. S=KlogW is Boltzmann’s formula for entropy. S is entropy, K is Boltzmann’s constant of nature, and W is the number of possible ways invisible components can be arranged without changing the appearance of what we see. W is the tricky one. Unless we can somehow count the invisible things, we are out of luck. What we can’t see are the physical interactions that give rise to the impression that there is a giant beast breathing deep within our planet. At mile 51 we encounter the Bright Angel shale at river level. The Bright Angel is the middle member of the Tonto group, and represents a transition from the sand dunes of the underlying Tapeats (mile 58) sandstone to near shore sediments. The Bright Angel is like the Moenkopi or the Hermit shale, except that it interfingers and grades into the Muav from west to east, following the marine transgression. As encountered by river runners, The Muav, laid down in marine conditions, begins younger. Wouldn’t it be too simple if the Grand Canyon could just be read like a book with a few pages torn out? The Grand Canyon Supergroup is first encountered just before mile 69. The unconformity between the Tapeats and the Supergroup, as first encountered by boaters as the Dox formation is half a billion years! This is basically the amount of time from the Muav to the present day. The Supergroup strata are inclined at about 15 degrees compared with the essentially level Paleozoic section above, and the Supergroup pinches out against even more steeply inclined Vishnu basement below, so the Supergroup does not even exist many places in the Grand Canyon. The Dox, the first unit encountered on the river, is not even the youngest member of the Supergroup, the younger strata having pinched out. If we think of books, The Grand Canyon is really three books. The first book is the Paleozoic section. It is relatively level, has a few pages missing, and basically extends from the “Cambrian Explosion” of multicellular life forms to the Permian Therapsids (funky lizards)–from the Tapeats sandstone to the Kaibab limestone. This first book encompasses ~300 million years from 544 to 245mya. The second book is the Supergroup. It is twice as thick, both physically and in time, but it is inclined and does not extend to much of the Grand Canyon. In the history of life, the Supergroup extends from the evolution of sexual reproduction in single celled creatures through the Marinoan glacial period or “Cryogenian”. This second book encompasses ~600 million years from 1250 to 650mya. The third book is nearly illegible. The Vishnu metamorphic complex has been squished, stomped, and injected. Many of what were once level strata are now vertical in the inner gorge. Many areas were never sedimentary pages at all, but blobs of ascending magma called plutons. 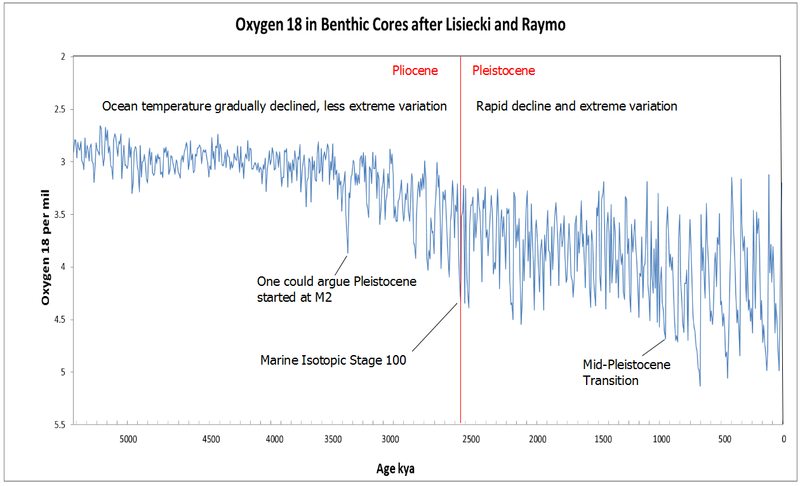 The isotopic information we use to date rocks gets overwritten each time the rock is melted or metamorphosed, so we can’t really know how old the sediments were. The dates of last crystallization range from 1.85 to 1.7 billion years ago. This is about the center of the period when the most advanced life forms were single cells that had learned to keep their DNA in a nucleus (Eukaryotes). The Vishnu is first encountered at mile 78. There are still over 200 miles yet to run, but the entire geological sequence has been revealed. Due to undulations in the strata, the river will actually “climb” out of the Vishnu gorge into younger strata again, before cutting a second Vishnu “lower gorge” further west. MODTRAN deals only with infrared light, and at least the version we are using includes only low level cloud types. Above is a screen shot of the menu. It can be seen that the highest altitude is three kilometers. This is unfortunate. The atmosphere radiates at the Planck curve like a brick below one kilometer. 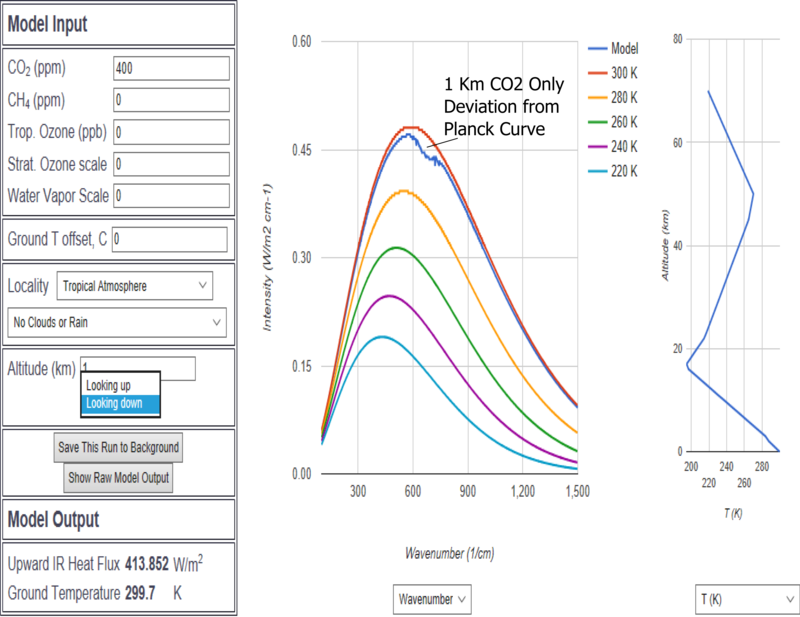 Significant deviations from the Planck curve begin at about a kilometer in the CO2 bands, and two kilometers in the water bands. The extent of MODTRAN cloud limitation can be seen above. Oh well, we will just have to work within the MODTRAN limitations and parse out the CERES deep convective data to get a direct comparison. 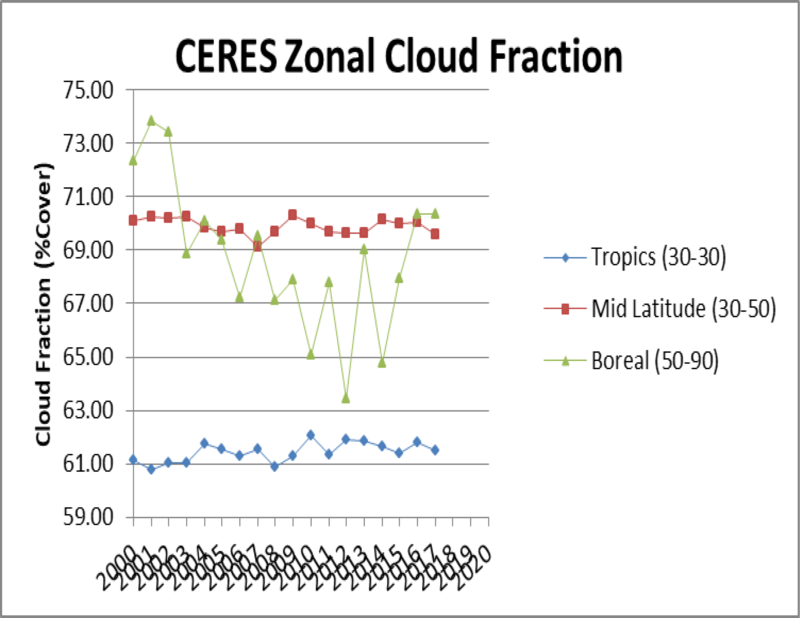 The CERES data has Cloud Area Fraction by latitude, and when latitude is sorted to our prior zonal criteria, you get the result above. 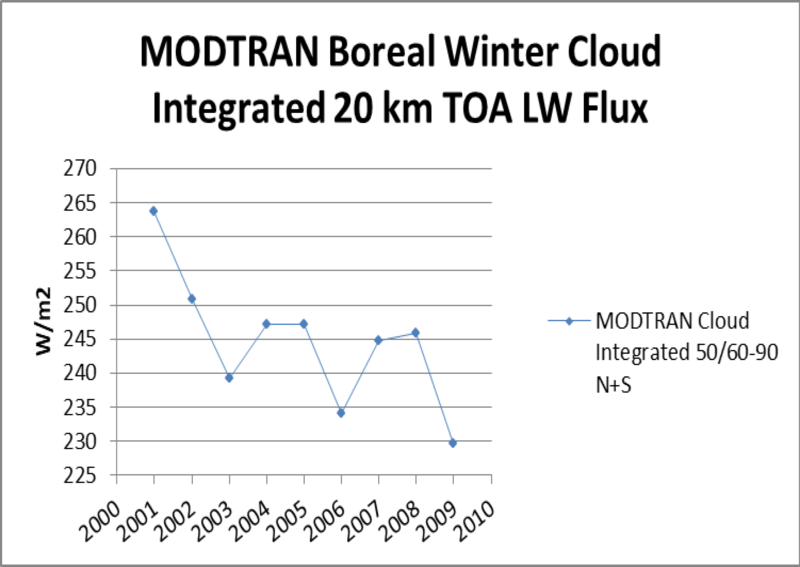 The general decline in boreal cloud fraction is interesting. 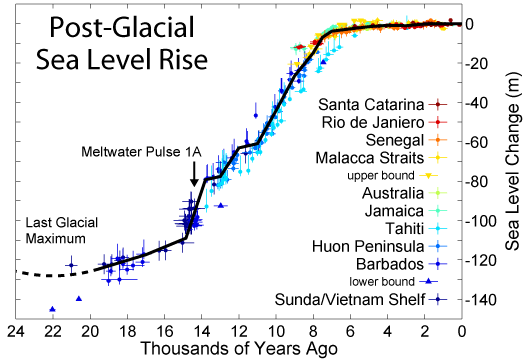 It shows a steep decline from the millennium to 2012, and then a partial recovery. Tropical cloud fraction possibly shows a small increase, and mid latitude fraction seems steady. 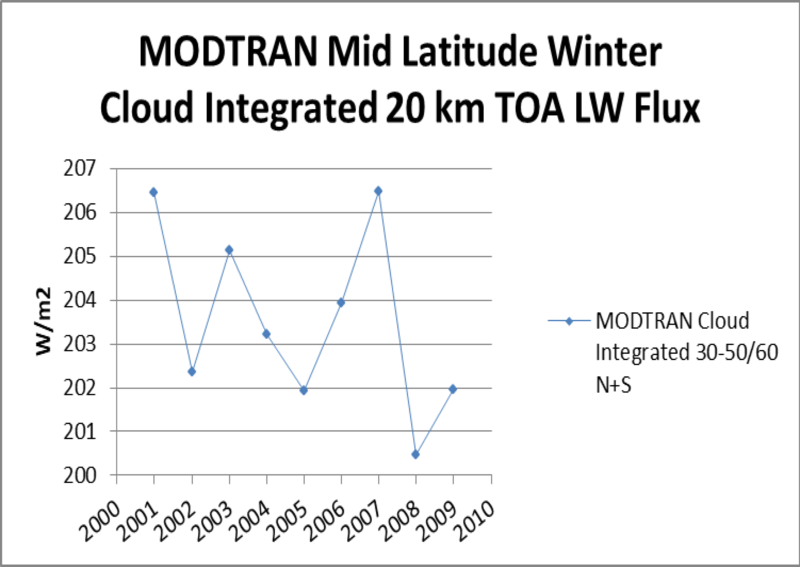 What we must do to compare CERES and MODTRAN is multiply this cloud area fraction by the percentage of cloud types in the MODTRAN menu. For that, we need cloud type data, and fortunately ISCCP has this data from 1983 to 2009. It can be seen above that the period shows a steady decline in cumulus, interrupted by the eruption of Mt. Pinatubo in June 1991 shown as a vertical line. Interesting that other cloud types were not impressed with the volcano. 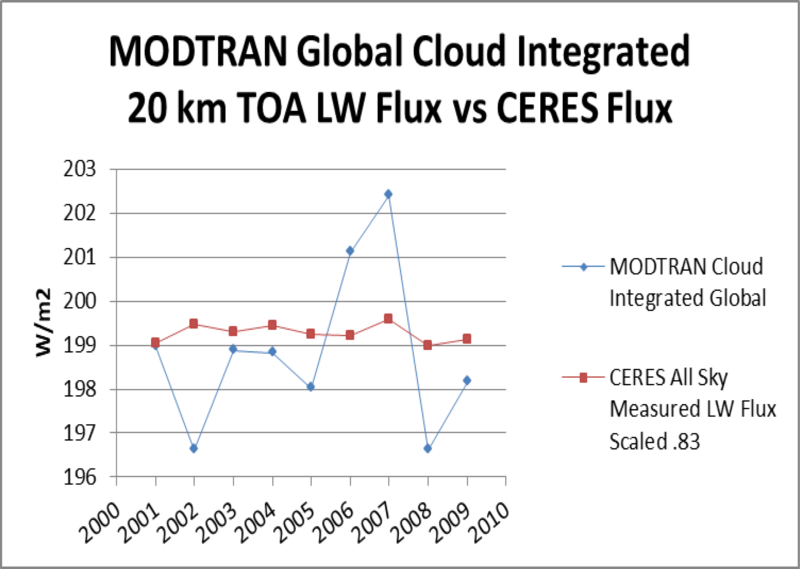 The CERES data we will be comparing with MODTRAN begins in 2001. Over the 2001-2010 period we see a decline and increase in annual variation of stratocumulus; a modest increase and plateau in altocumulus; and an increase and increase in annual variability of Nimbostratus. This annual variability seems peculiar, and we may return to this. Stratus clouds seem not to have changed much over the entire period. Notice that the low level clouds have the lowest percent coverage globally, at about 5%. We realized at the beginning that this exercise of comparing CERES and MODTRAN would be difficult. We are integrating data from three different and uncoordinated formats (CERES, MODTRAN, ISCCP). The differences in formats and data ranges allows only nine years (2001 to 2009) of direct comparison, as the ISCCP cloud type data ends in 2009. Differences in ranges of latitude between the different formats had to be normalized, adding uncertainty. 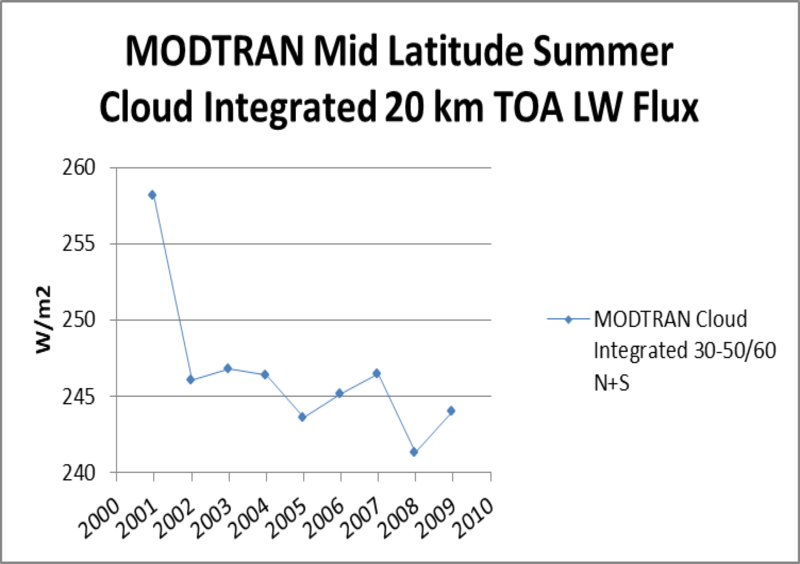 MODTRAN ignores deep convective clouds, which are imbedded in the CERES coverage data. Since MODTRAN is the source of the radiance data by cloud type, it is not possible to subtract deep convective clouds from CERES coverage rigorously. 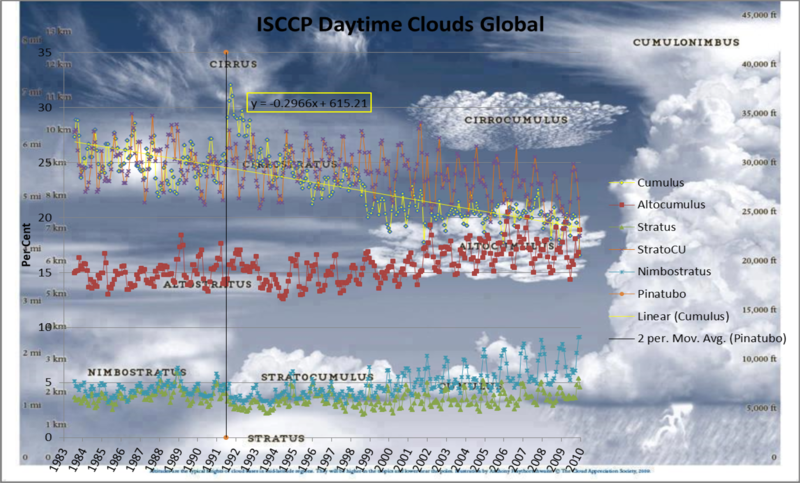 ISCCP cloud types are for daylight only, and CERES data is day and night. 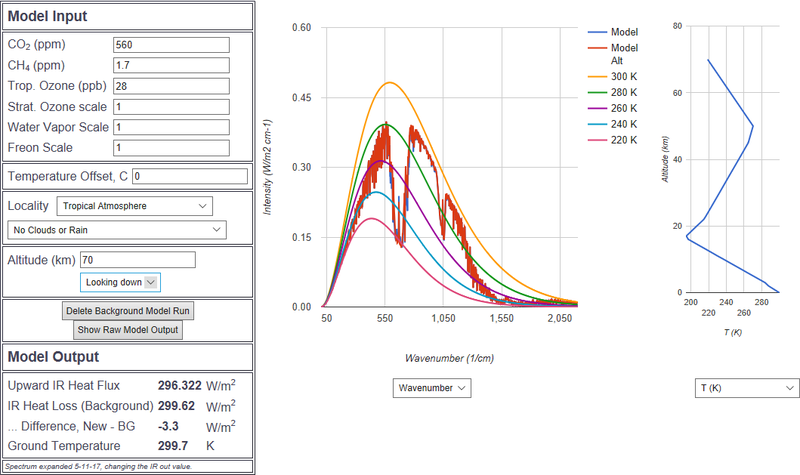 Nevertheless, the cloud integrated MODTRAN result is interesting. 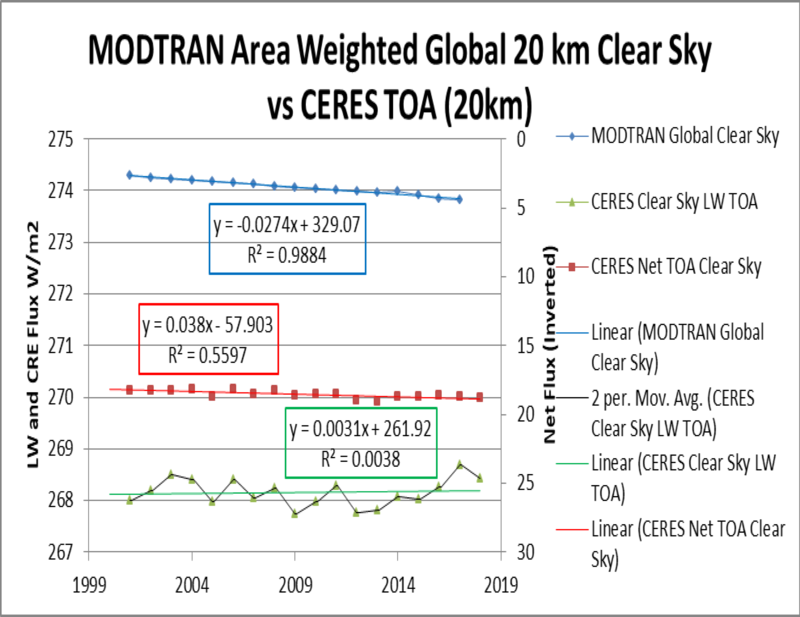 We can see that MODTRAN predicts far more variation than CERES measures. Any analysis of trend over nine years would be overreaching, particularly as MODTRAN variation wildly exceeds any apparent trend. 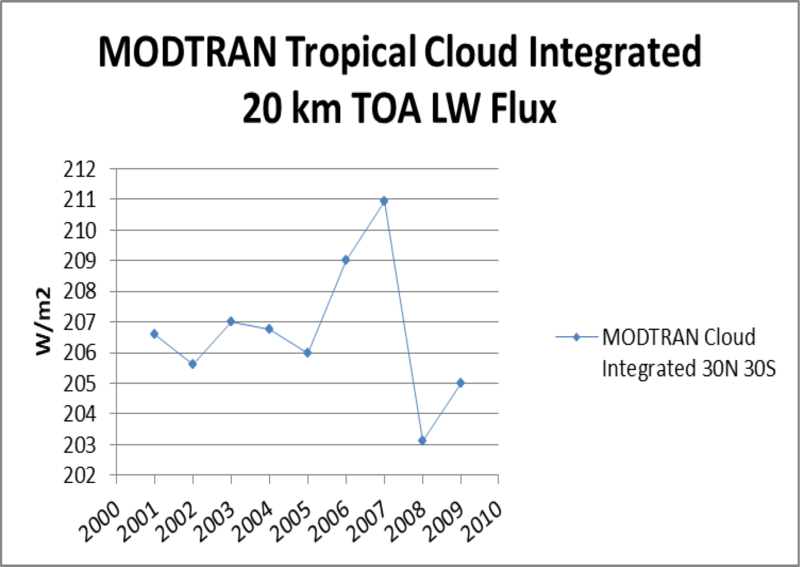 The 2006/7 spike predicted by MODTRAN results from modest increases is several cloud types (notably altocumulus in the IPCC graph above), probably from the weak El Nino of those years. We can recall from earlier in this series that the 2006/7 period showed high total precipitable water without any corresponding increase in atmospheric temperature. It seems that MODTRAN falls victim to this discrepancy. 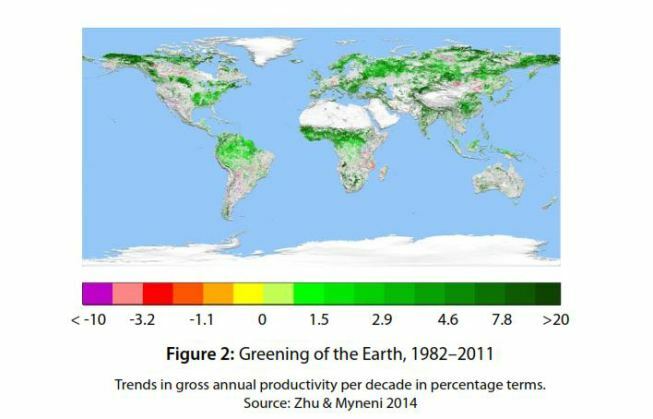 The MODTRAN global prediction is heavily influenced by the tropics, which cover 50% of the planet as defined here. Mid Latitude Winters show the 2006/7 spike far more than summers. Boreal summers and winters differ little and show little response 2006/7. 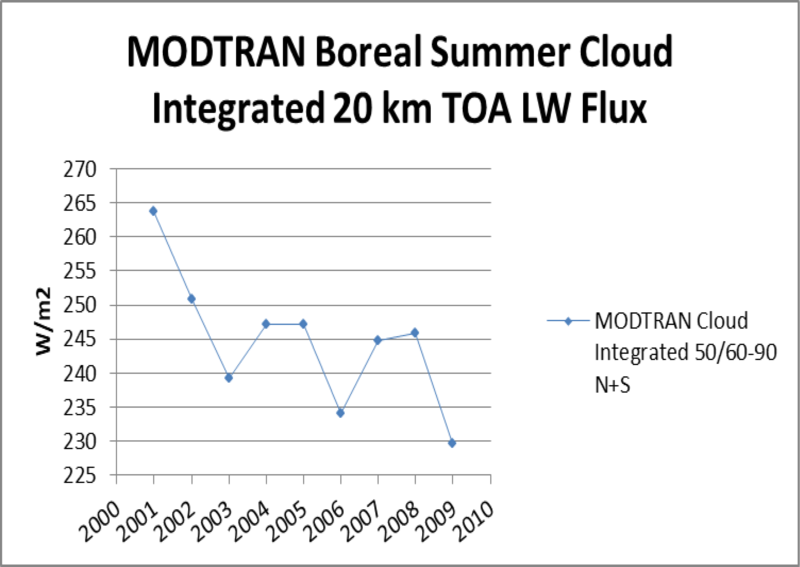 At the end of this seven post series, we cannot say that MODTRAN integrated for clouds shows the same divergence in trend from CERES that the two show for clear skies. 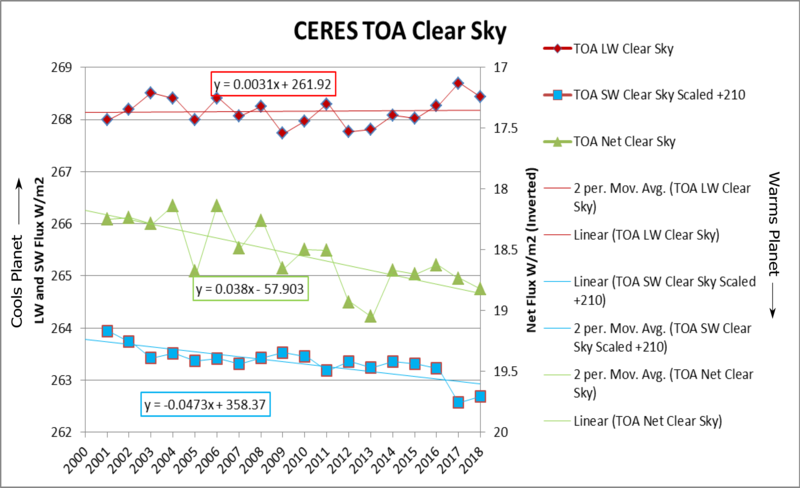 For clear skies, MODTRAN predicts a steady decrease in LW radiation to space, while CERES measurements show a small increase. If cloud type data could be found after 2009, this project could be extended, and perhaps reveal a divergence. All we can say at this point is that MODTRAN overreacts to the clouds, which according to CERES cover ~65% of the planet at any given time. CERES is the acronym for the rather chewy title Cloud Earth Radiative Effect Satellites. Displayed above is the TOA net flux in blue. 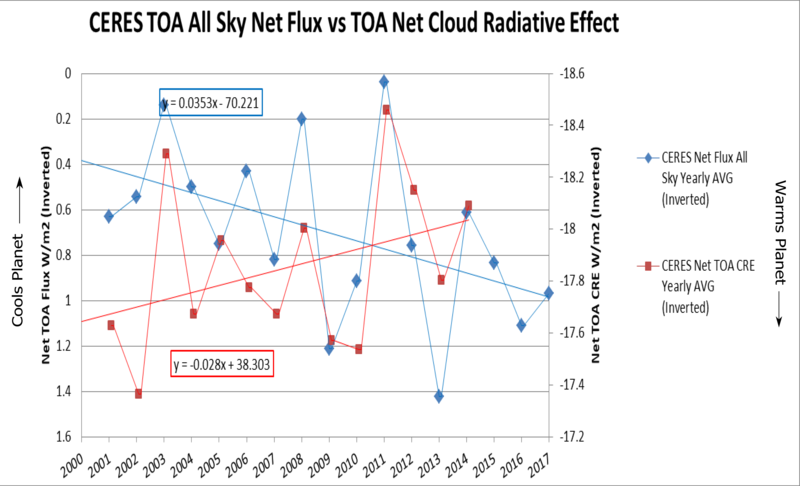 The net TOA cloud radiative effect is in red. The axes are inverted to maintain the energy lost/cools planet energy retained/warms planet format. The 2005 aberration is alive and well. There is a tension here because the All Sky net data already includes cloud effects, yet the two data series are working in opposite directions for the planetary energy balance. How can the all sky (including clouds) net flux, defined as incoming minus outgoing, be increasing; when the cloud only (net CRE) effect is pushing a roughly equal net amount of energy to space? We can deconstruct the net CRE signal into its LW and SW components above. This makes no sense at all. Both the LW and SW components are trending towards less radiation to space, but the net effect in the first graphic is clearly towards more radiation to space. When net CRE is compared with LW CRE above, it can be seen that they are opposing. 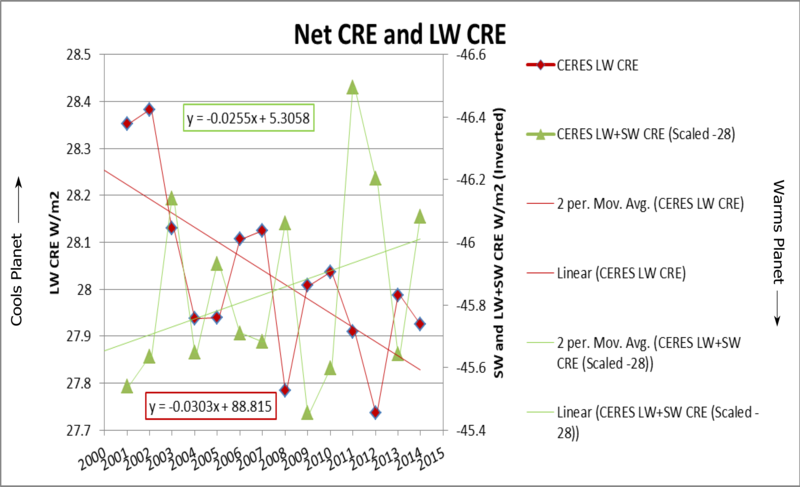 When net CRE is compared with SW CRE, there is far better accordance, but the trends are opposing. It might be noted that the SW trend is so miniscule as to be arguably no trend at all, but we stick with the data. 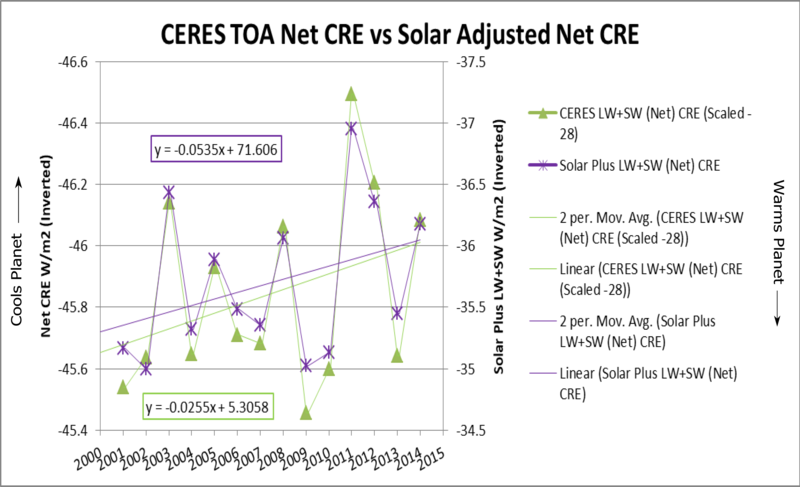 You may recall that solar adjustment improved the agreement between the planetary (not CRE) net TOA flux and the component LW and SW fluxes. So it is with the CRE net flux above. Basically, they are removing the solar aspect from the component fluxes. That’s ok, but it would be better to be more explicit. Are clouds warming or cooling the planet? LW all sky TOA flux, which includes clouds and simply measures LW photons leaving for space, has cooled the planet ~.5 W/m2 since the millennium, according to the trend. LW CRE over the same period has warmed the planet by ~.4 W/m2. We conclude that without the moderating effect of clouds, LW TOA flux would have cooled the planet by .9 W/m2. Bear in mind that clear sky LW TOA flux, which shows little trend, radiates to space 18 W/m2 more than all sky with clouds. 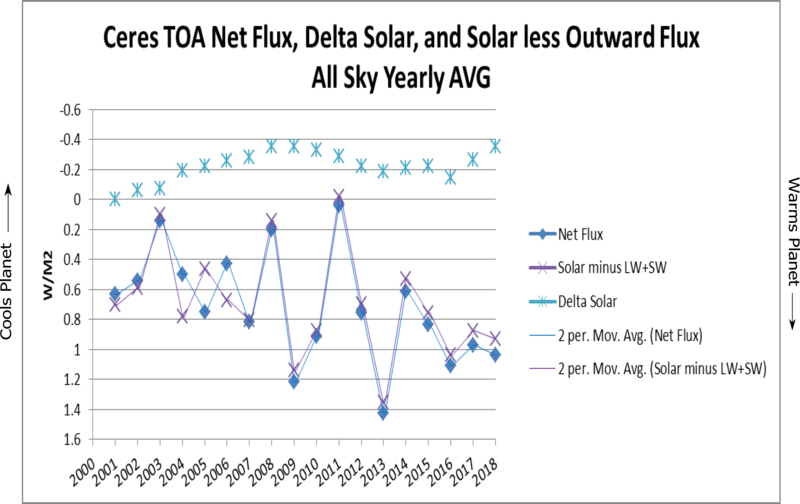 SW all sky TOA flux, which includes reflection from clouds and measures SW photons leaving to space, has warmed the planet ~1.3 W/m2 over the period, according to the trend. 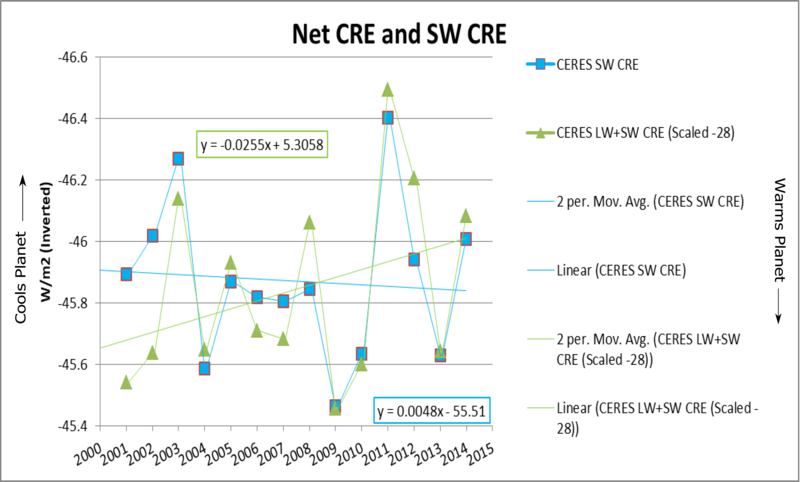 SW CRE over the same period has warmed the planet by maybe .1 W/m2. We conclude that absent solar fluctuation, reduced SW TOA flux is warming the planet, but little of the warming comes from clouds. Something else is increasingly absorbing SW radiation. The net of LW and SW all sky TOA fluxes without solar fluctuation is to warm the planet ~1.3 W/m2. 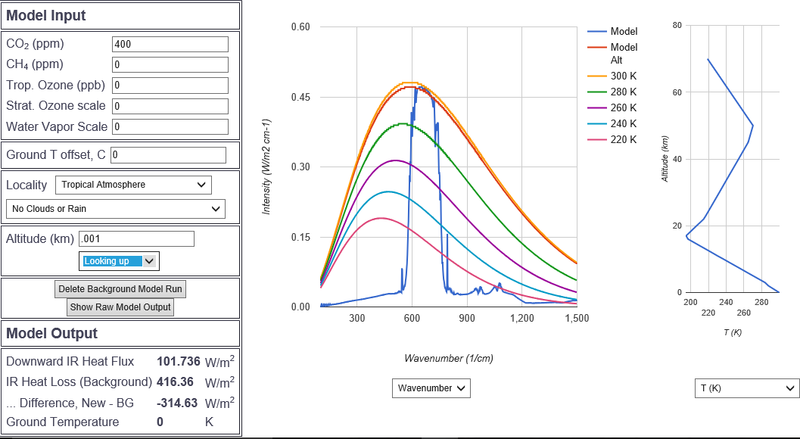 When the sun is included in the net TOA all sky flux, the warming is reduced to about .5 W/m2. Now we are ready to see what the MODTRAN radiative transfer program predicts about clouds in the next post. We must begin by confessing that we have resorted to digitizing. The first CERES data were garnered by mousing over the visualization tool, writing in a notebook, and typing into Excel. We discovered that if we right clicked the tool and “inspected the element”, the data was there in a weird bracketed format that could be copied. By doing this we saved lots of time copying and pasting a few series rather than scribing and typing, but this caused the visualization tool to crash. Subsequently, access to the data this way has been denied. Since CERES “Net” data is defined as incoming minus outgoing, positive numbers indicate energy retention. The “Flux” data is all outgoing, and indicates energy loss. To correct for this we initially multiplied the flux data by -1. This pointed the data in the proper direction, but caused all sorts of confusion in comparison with Net Cloud Radiative Effect data, which uses the same definition of “net”, but is all negative numbers. All the graphics in this series have been changed so the net flux axis is in positive numbers, but inverted to point the data correctly. The above two graphics are the same with the net flux axis inverted so the trends make sense in terms of cooling or warming the planet. This format will be used henceforth. 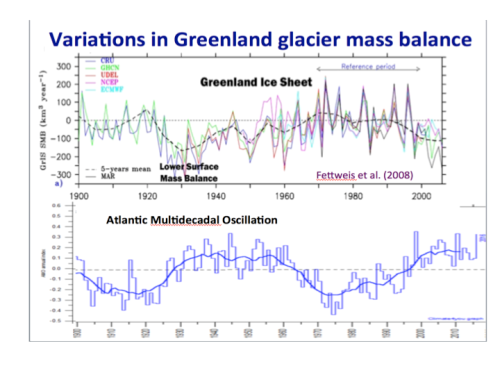 The data above is doing everything wrong according to greenhouse theory. The slopes are small, and probably not statistically significant, but they are definitely not pointed in the “right” direction. The “right” direction would be a decrease in Longwave and Net radiation to space, and an increase in Shortwave (reflected from increasing clouds) radiation to space. 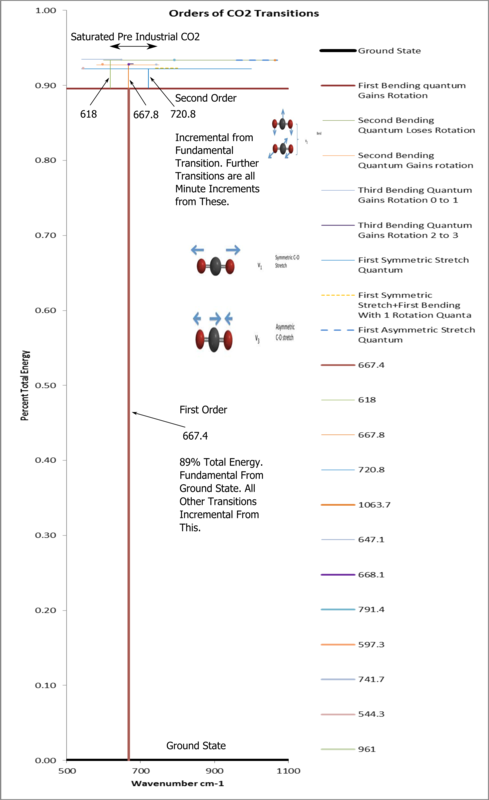 How does the net flux increase when the SW flux decreases more than the LW increases? This quandary is illustrated well above. 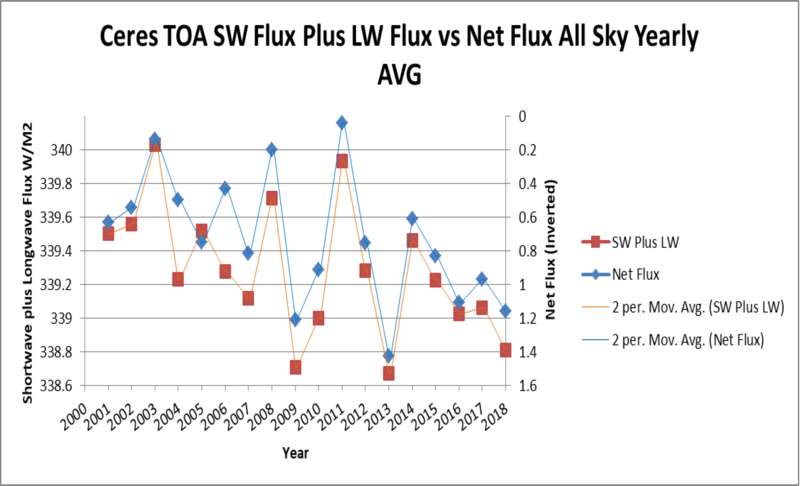 SW and LW outgoing fluxes are added together and compared with inverted net flux. The SW flux decrease is twice the all sky longwave flux increase. Since incoming solar is fairly constant, and the SW outgoing decrease increases the net, SW+LW is a reasonable approximation of inverted Net. There is a consistent aberration in 2005. Aberrations often hold important lessons, and the 2005 aberration may be the topic of a future post. It turns out that solar variation becomes important at the subtle scales we are working with here. 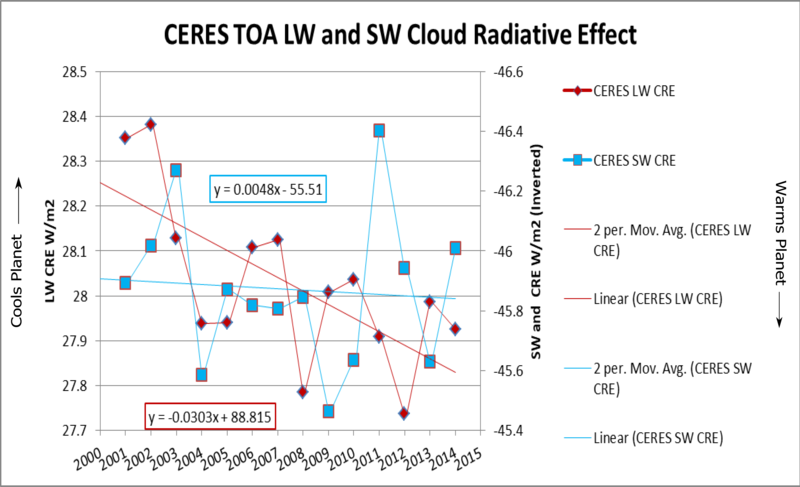 The solar variation adjustment to LW+SW outward flux above improves the correlation with inverted Net, but exacerbates the 2005 aberration. Another clue. You have probably noticed that this is an adventure, not a script. 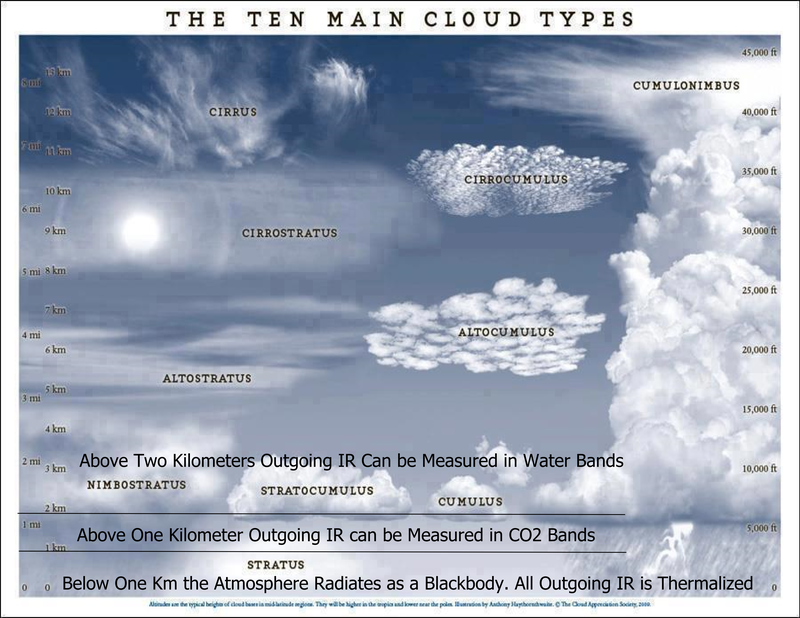 We will get to prior promises, but the next post must deal with cloud radiative effects. The tile of this series promises a comparison of CERES and MODTRAN. The groundwork of exploring the CERES data in the first three posts is done. At the conclusion of the first post, we concluded that CERES and MODTRAN could not both be right. MODTRAN has no time dimension. It differs only on the basis of gas concentrations in the atmosphere, and it deals only with infrared (IR) light, the spectrum the earth radiates based on its temperature. MODTRAN can be related to CERES in time by adjusting atmospheric CO2 concentration to match the yearly values. We used the data from Mauna Loa in Hawaii. The comparison is further complicated because polar orbiting CERES data covers the entire planet, and MODTRAN data is broken down into tropics, mid latitude summer, mid latitude winter, subarctic summer, and subarctic winter. CERES data defines the top of the atmosphere as 20km. 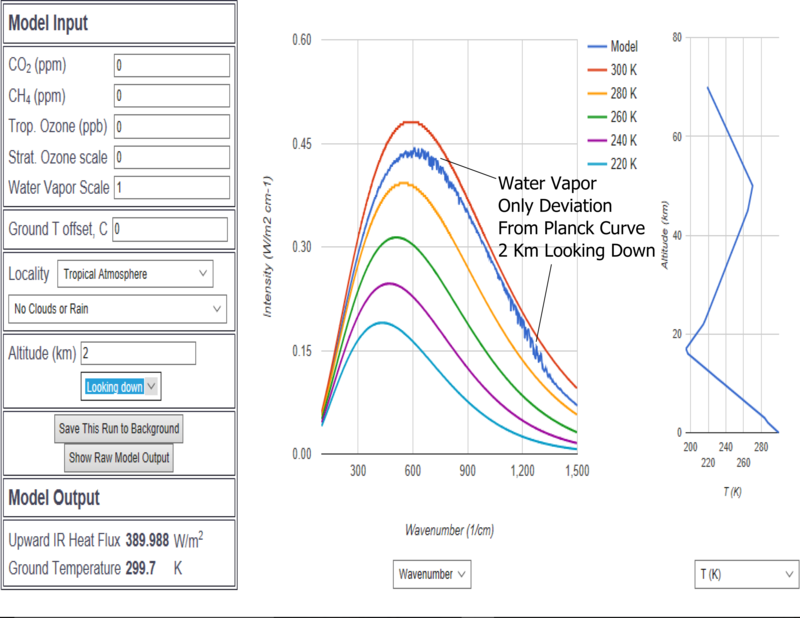 This is easy to match in MODTRAN by setting the altitude. CERES TOA data is limited to clear sky and all sky. All sky, which is whatever the satellite saw, is what we would like, but MODTRAN has a smorgasbord of cloud options that would be difficult to relate. Accordingly, we have matched CERES clear sky with MODTRAN clear sky. We decided to simplify the problem by weighting the MODTRAN “tropics” at 30 north to 30 south latitude, which conveniently is 50% of the planet surface. The subtropics were given 30 to 50 degrees in both hemispheres, summer and winter were averaged, and weighted at 26%. We gave subarctic all the rest, averaged summer and winter, and weighted at 24%. The result, at the top of the graphic above, predicts a modest but steady linear decline in IR radiation to space as CO2 concentration increases. The CERES measured LW data at the bottom of the graphic is more jumpy, but definitely does not show a steady decline as MODTRAN predicts. In the middle of the graphic, plotted on a second axis, CERES net clear sky data, which includes shortwave reflection, is inverted to show that increases in value result in net energy gain. It is worth bearing in mind that the CERES time series basically corresponds with the “pause”, the lack of statistically significant warming in satellite lower troposphere datasets between the millennium and the 2016 el Niño. The lack of any reduction in CERES clear sky radiation to space, as MODTRAN predicts, suggests that CO2 is not driving warming. CO2 remains when the clouds are gone. Water vapor that has not condensed remains when the clouds are gone. 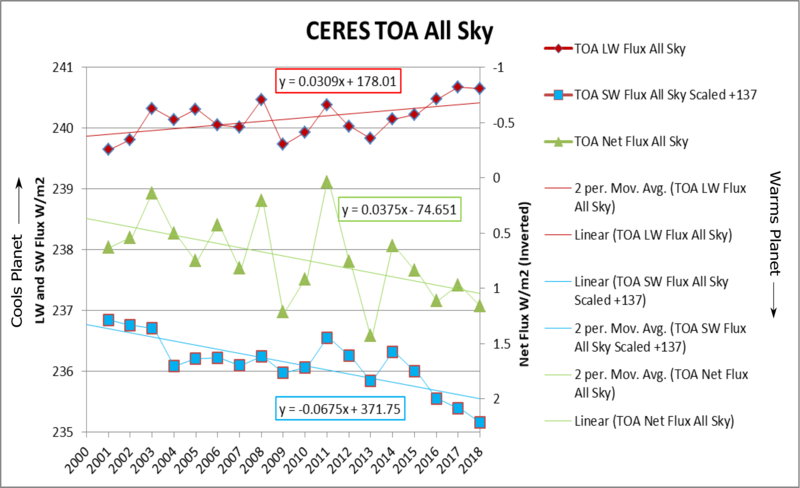 The CERES all sky data is what shows the reduction in TOA radiation to space. The difference between clear sky and all sky is clouds. It appears that clouds are warming the planet. 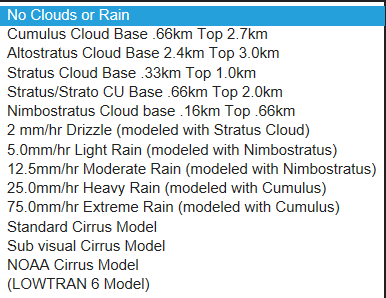 To continue this comparison of CERES and MODTRAN, we will need to figure out how to equilibrate the smorgasbord of cloud options in MODTRAN with “all sky” in CERES. We will attempt this in the next post. In the first post in this series we began with an assertion that according to greenhouse theory, it is impossible to warm the planet when longwave radiation to space is increasing. In the second post we discovered that it is possible for the planet to warm while longwave radiation to space increases if shortwave absorption increases. The first post has been corrected. If shortwave absorption is increasing, the questions become, “How?” and, “Where?”. NOAA ESRL has a long time series of atmospheric precipitable water (TPW) extending back to 1948. This time series shows a very small increase to the present and can be characterized as moving from higher values after WWII to a nadir in the late 70’s/mid 80’s, and increasing again to the present; much like surface temperature. 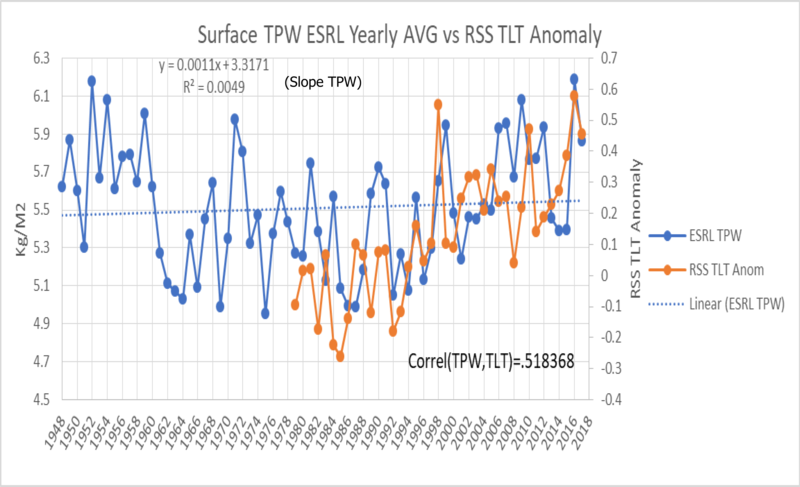 In the graphic above this TPW series is compared with RSS satellite lower troposphere (TLT) data. The correlation is not impressive, but there is reasonable agreement. 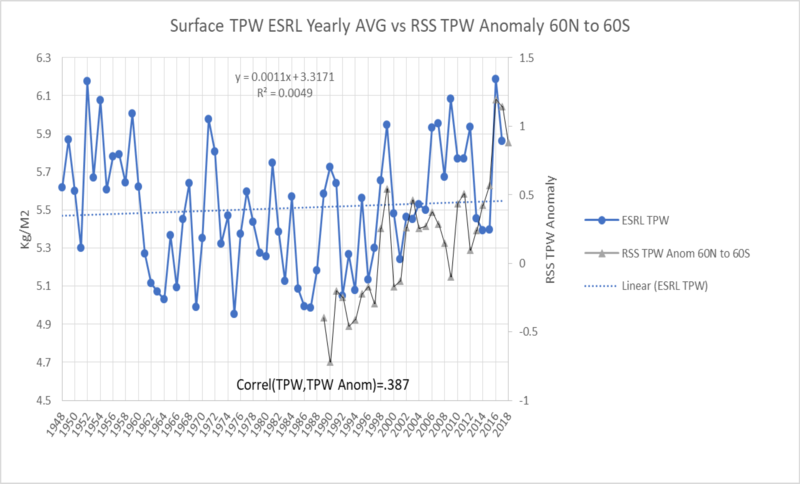 RSS has its own shorter TPW time series that excludes polar regions, and it is compared with ESRL TPW above. The correlation is poor, as will result from the trends being inverse from 1989 to 1997; but once again there is reasonable agreement. The burning question is what the satellites would have seen between 1948 and 1988. A reasonable supposition is that they would have generally tracked ESRL, with a poor correlation. 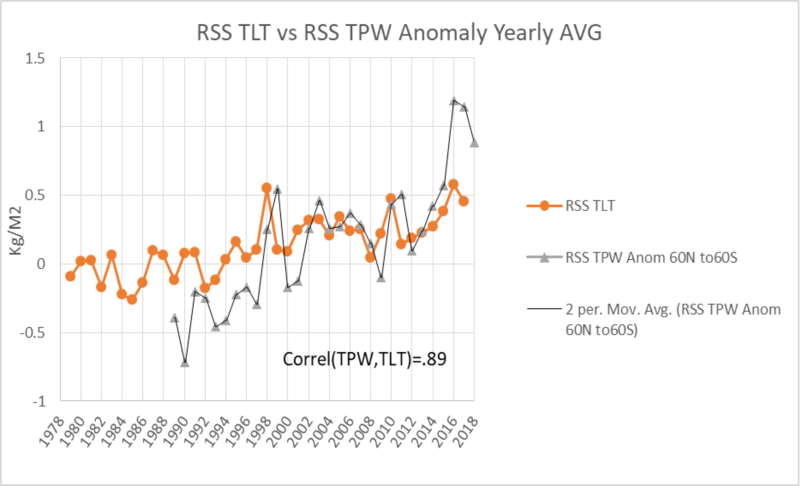 When the RSS TPW is compared with RSS TLT above, the correlation is good, but the trends appear divergent. The point of all this is that if our increased shortwave absorption from CERES takes place in the atmosphere, it is probably going to be from increased atmospheric water. We colored this Wikipedia image blue in the water shortwave absorption bands a while back. Oxygen, particularly in transition to ozone is a significant absorber in the SW solar spectrum. We will see when we get to MODTRAN that there is significant ozone formation near the surface as well as the stratosphere. CO2 absorption in the SW spectrum is limited to small areas near 2000 nm, shown green. In the bands where the surface irradiance is decreased by atmospheric absorption, but some light still makes it through; adding more gas will increase the warming of the atmosphere and further decrease the warming of the surface. In the water bands where surface irradiance is already zero, adding more water will have no effect on the surface. These bands are about 19% of the total absorption by water. The amount of light can’t change much. Like the sun, the earth radiates at an intensity and wavelength governed by temperature. In this sense one can think of the earth as the sun for outgoing longwave, and the atmosphere is caught in a crossfire between the two. The crossfire becomes particularly wicked for reflected shortwave from the sun. In this case, the graphic above must be turned upside down. The atmosphere gets a second chance to absorb the photons that made it through the first time, and the longwave from the earth and the shortwave from the sun are both heading for space. The longwave that makes it out reduces the temperature of the planet, the shortwave that makes it out does not. Even after all the atmospheric absorption and reflection from clouds, over half of the incoming solar SW makes it to the surface. Something like 7% is reflected from the surface, leaving just less than half absorbed by the surface. The surface is warmed, and radiates longwave out. 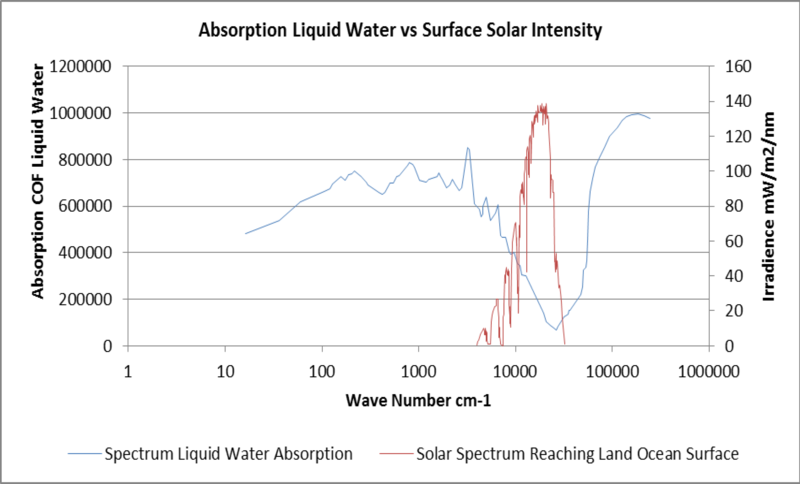 Seventy percent of the surface is water, but as the graphic above shows, the shortwave absorption by water is at its lowest at the peak intensity of solar SW radiation. 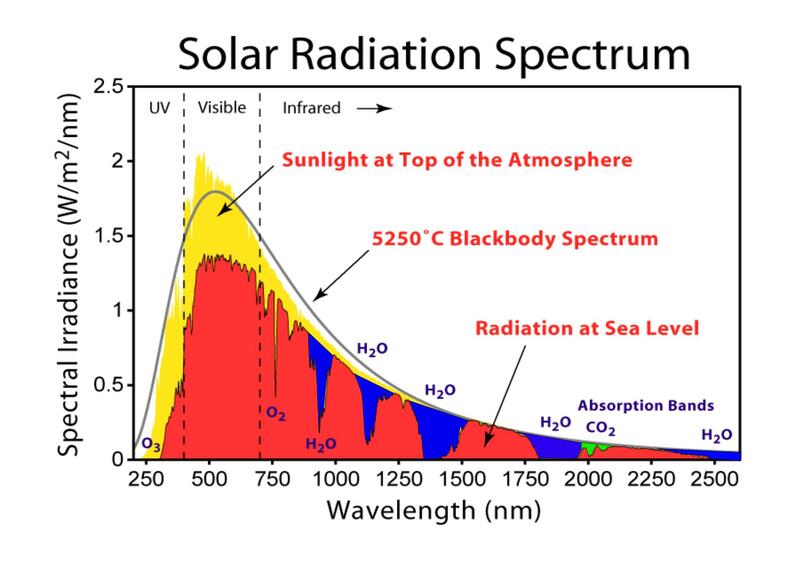 The peak of solar intensity is in the visible wavelengths, and any diver knows that visible light penetrates to considerable depth, depending on turbidity. The ocean is still absorbing SW, albeit less efficiently than it might. We really don’t have the tools yet to determine whether the atmosphere or the surface is where the CERES increase in SW absorption is predominantly taking place. Sea surface temperature, atmospheric temperature, and atmospheric precipitable water are all rising; together, as the laws of physics decree they must. According to NASA (and Mr. Trenberth), the surface is radiating more energy up as longwave than the TOA receives as shortwave. We can address this, and longwave radiation to space, with MODTRAN in the next post.